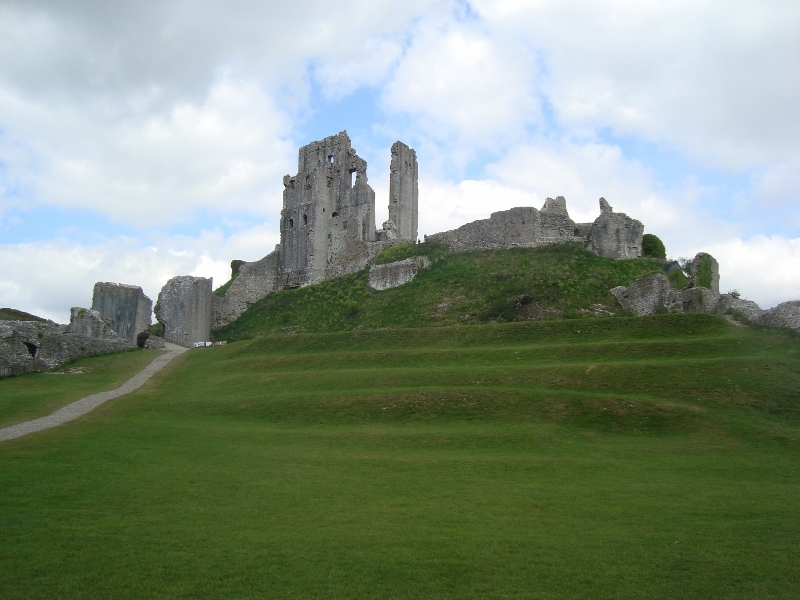 Corfe Castle, Dorset – Standing in a glorious location, on a hill adjacent to a picturesque village and a steam railway, Corfe sprawls across the hillside like some deserted ancient city. Dominated by a towering keep, the fortress was once a royal castle, but its finest hour came during the civil war, when it was twice defended by the redoubtable Royalist heroine Lady Mary Bankes – one of my role models for the Dowager Countess of Ravensden in the Quinton novels. Corfe is also at the heart of one of the most intriguing pieces of historical revisionism in recent years, namely Ian Mortimer’s fascinating deconstruction of the famous story of the death of King Edward II – Berkeley Castle, red hot poker, need I say more? – leading to his thesis that Edward did not die at Berkeley in 1327 at all. 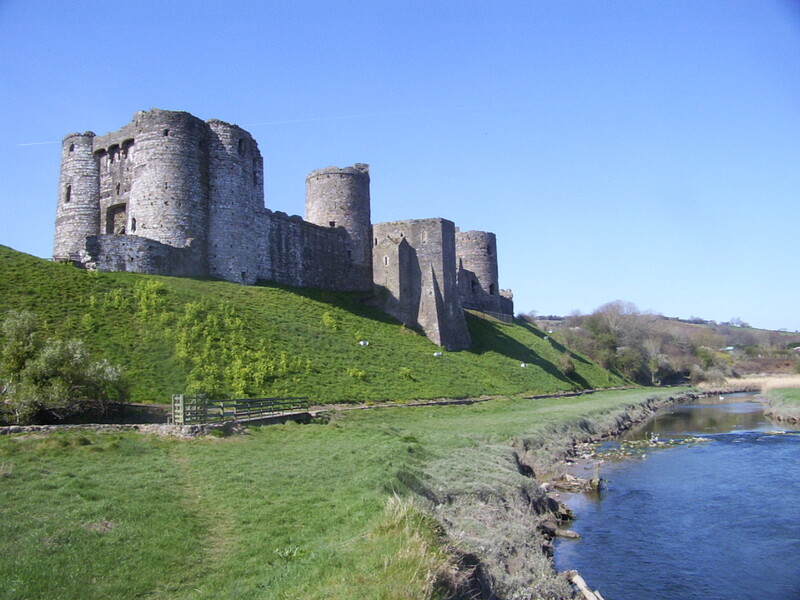 Kidwelly Castle, Carmarthenshire – If Kidwelly was in North Wales, or pretty much anywhere in England, it would be a massive tourist destination. It possesses many of the essential features of the biggest and best ruined castles, including walls and towers that still stand virtually to their full height, wall walks with great views, and one of the best dungeons you’ll find anywhere. As it is, though, it’s tucked away in a corner of West Wales that’s by-passed by the major routes and is a bit tricky to get to, so you can be there even in the height of summer and sometimes have the place virtually to yourself. When I was growing up, though, it was the nearest major castle to where I lived, and after discovering the pleasures of history for the first time at Pembroke, it was frequent visits to Kidwelly that really developed my historical imagination. Much later on, I discovered that a very distant ancestor was probably a man-at-arms in the castle garrison in the fourteenth century, so maybe my connection to it was literally in the blood! 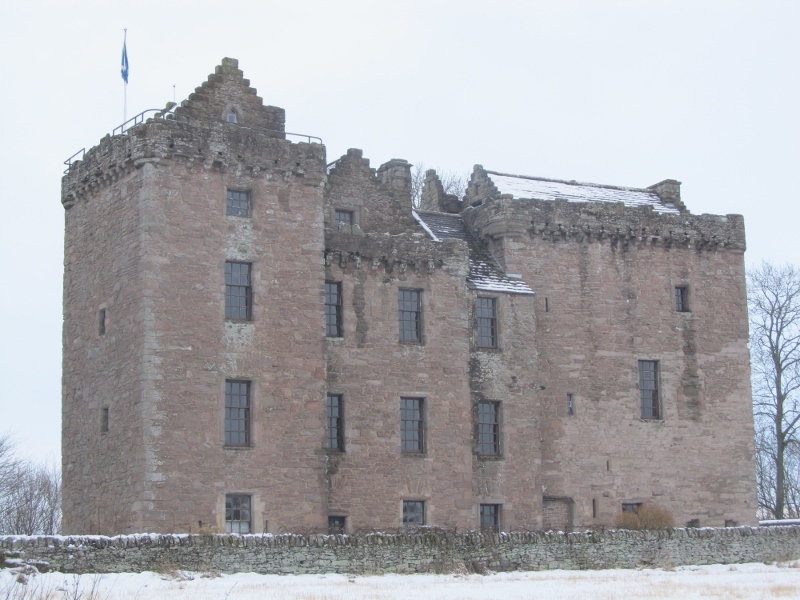 Huntingtower Castle, Perth – There are plenty of Scottish castles that are larger, more impressive, or more scenically located, but for sheer atmosphere, few can touch Huntingtower. I got to know it well when researching what I refer to, actor-like, as my ‘Scottish book’, Blood of Kings: the Stuarts, the Ruthvens and the Gowrie Conspiracy. This was the seat of the Ruthvens, Earls of Gowrie, and originally consisted of two separate tower houses just a few yards apart, a strange arrangement that probably resulted from a complex family settlement in the fifteenth century. The layout gave rise to the legend of the ‘Maiden’s Leap’, which has a Ruthven daughter fleeing upstairs so her mother won’t catch her in bed with her lover, and then jumping from one tower to the other. Rather more certainly, the castle was the setting for the ‘Raid of Ruthven’ in 1582, when the first Earl of Gowrie imprisoned the young King James VI here. During research visits, I stayed twice in the cottage immediately adjacent to the castle, and the sight of the eerie old fortress in frosty dawns or at autumnal dusks will remain with me always. 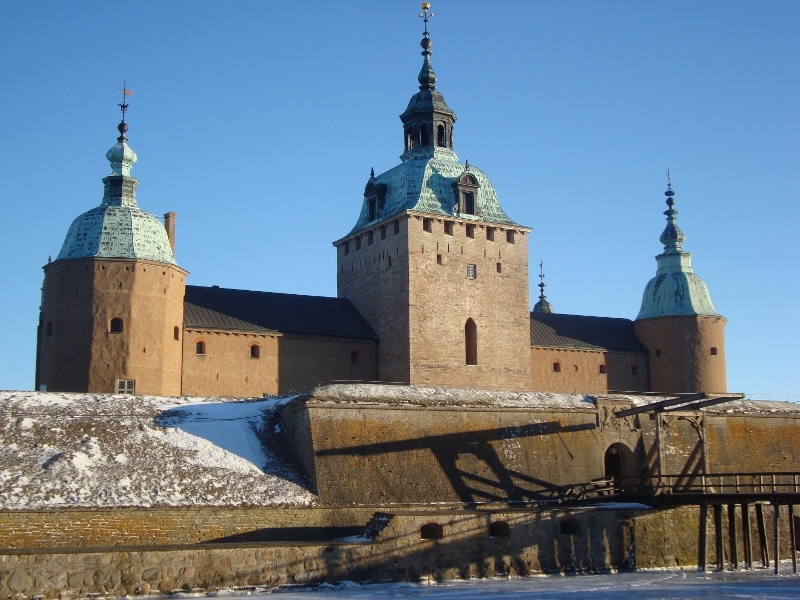 Kalmar Castle, Sweden – When I was researching the fourth Quinton novel, The Lion of Midnight, I stayed for several days in Kalmar, a lovely historic old town in the south-east of the country. My hotel was right next to Kalmar Castle, and as it was a snowy February, the castle was a true picture-postcard sight, with the sea around it frozen over. I didn’t set any of the action directly in Kalmar, but it became the model for one of the central settings of the book; and my other reason for staying in the town was to visit the museum which houses the many artefacts recovered from the wreck of the Kronan, the vast Swedish warship designed by an Englishman, Francis Sheldon, which went down in the Battle of Öland (1676). The castle was a royal seat, so it contains vast halls, a splendid chapel, and many ciphers of Swedish monarchs, notably Gustavus Adolphus and his enigmatic daughter Queen Christina. 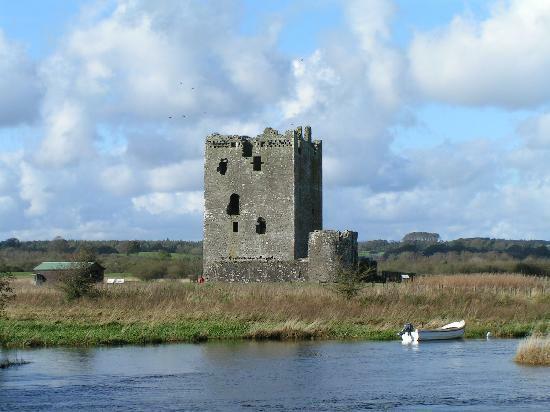 Threave Castle, Dumfries and Galloway – There are some castles that you drive to. There are some castles that you walk to. There are even some castles that you can still get to by steam train (i.e. Corfe, above). And then there’s Threave, which you have to be rowed to – yes, rowed. Standing on an island, albeit one that’s considerably larger than when Threave was in its pomp as the seat of the mighty Black Douglases, the enormous tower house simply exudes power and menace. It was even built by someone called Archibald the Grim: let’s face it, Scottish history has all the best names. Alas, though, I can’t post any of my own digital photos of it: I took plenty during my last visit a few years ago, but then committed the cardinal sin of not backing them up before my hard disc died. 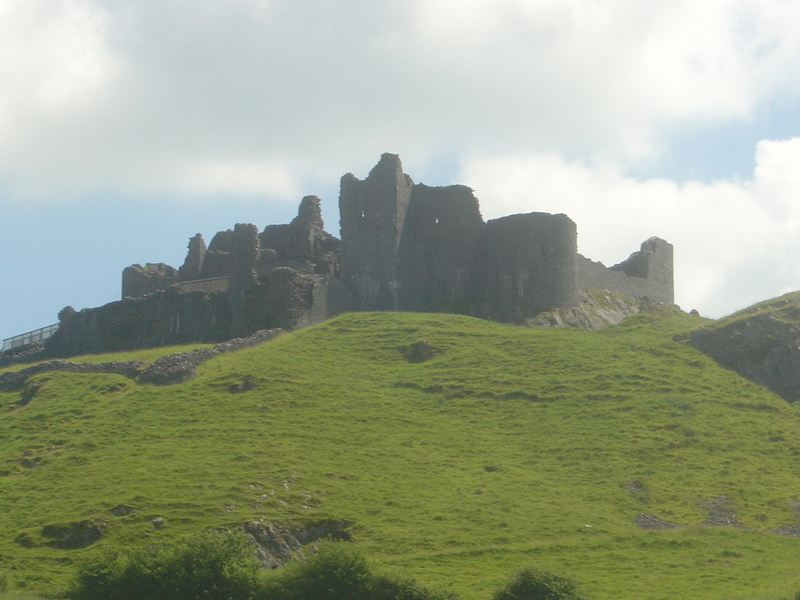 Carreg Cennen Castle, Carmarthenshire, and Tantallon Castle, East Lothian – Carreg Cennen was another castle that I grew up with. Even if we weren’t visiting, it was a prominent landmark on one of the roads going north from my hometown of Llanelli: standing on a vast crag, it dominates the landscape for miles around. Although the buildings themselves are pretty ruinous, it’s all about the location – not to mention the cave, an astonishing feature that wends its way through the cliff beneath the castle. 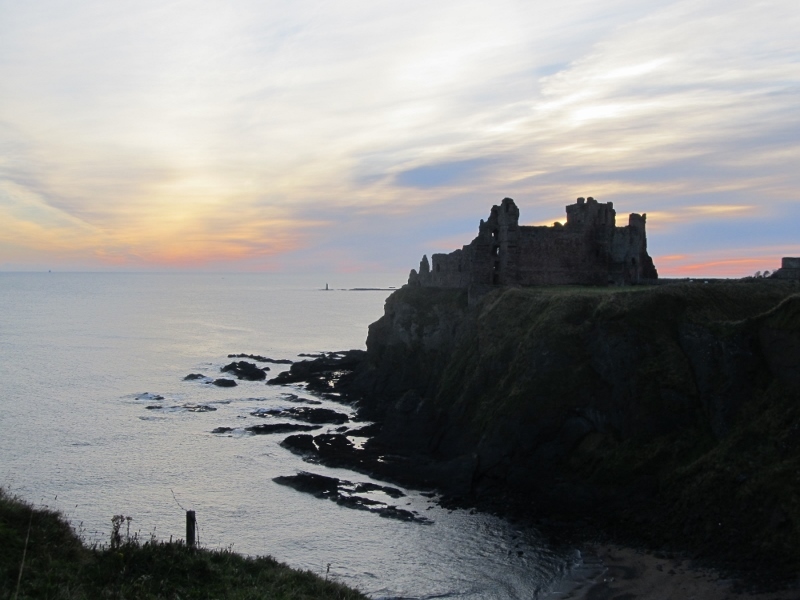 For many years, though, getting to Tantallon was nothing more than a ‘bucket list’ ambition – another of those places that I’d seen a picture of in a book when I was young, and decided that I had to get there one day. Eventually, of course, I did, and was astonished by what I found: Tantallon, once the seat of the Red Douglases, Earls of Angus, consists chiefly of a vast red curtain wall that cuts of a clifftop peninsula. It’s a stunning sight from any angle, and I’ve since been back many, many times; indeed, last year I took a cottage adjacent to the castle while working on the plot construction for the next Quinton book. So Carreg Cennen and Tantallon are jointly top of my list! There won’t be a post next week due to the manifold ramifications of a family wedding, so Gentlemen and Tarpaulins will return in two weeks!